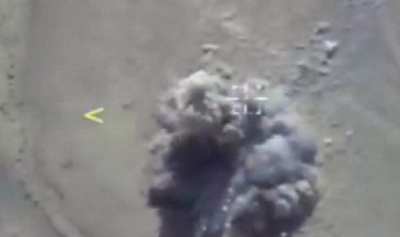 This is the moment 200 ISIS militants were annihilated by Russian air strikes as coalition forces look to flush the terror group out of Syria by battering them from the air. Russia said it has intensified its air campaign in Syria to help President Bashar Assad's forces drive Islamic State militants from Deir el-Zour, a major stronghold for the group, killing an estimated 800 militants across the country this month alone. Colonel General Sergei Rudskoi said Russian jets are now making 60 to 70 flights a day to target militants heading from other areas to join the fight in the eastern city. He says Syrian troops are meanwhile advancing from three directions to encircle Deir el-Zour. In the most recent raids, 200 terrorists were killed when an ISIS convoy was targeted as they headed towards the eastern city. Syrian government forces control around half the city and a nearby air base, both of which are besieged by the militants. Rudskoi said militants fleeing US-backed offensives in the Iraqi city of Mosul and the Syrian city of Raqqa have poured into Deir el-Zour in recent months. He said Syrian troops have also encircled Akerbat, an IS-held town in central Syria, and that Russian warplanes have targeted militant convoys trying to flee the area for Deir el-Zour. Russia has waged an air campaign in Syria since September 2015 aimed at helping Assad's forces defeat IS as well as Syrian rebel groups. This month alone, Russian warplanes have flown 990 missions, destroying 40 armored vehicles, more than 100 trucks and killing about 800 militants, Rudskoi said.